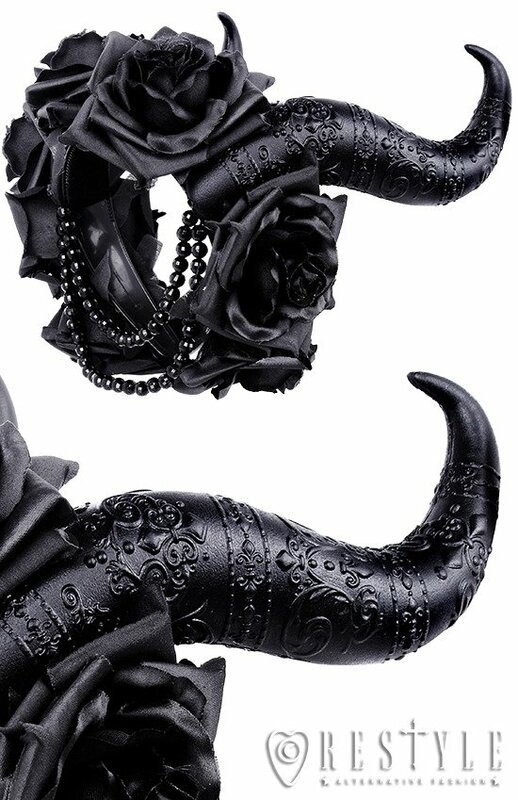 Wide headband adorned with black horns with our unique pattern. Horns are made of very durable material, and very firmly attached to the headband. 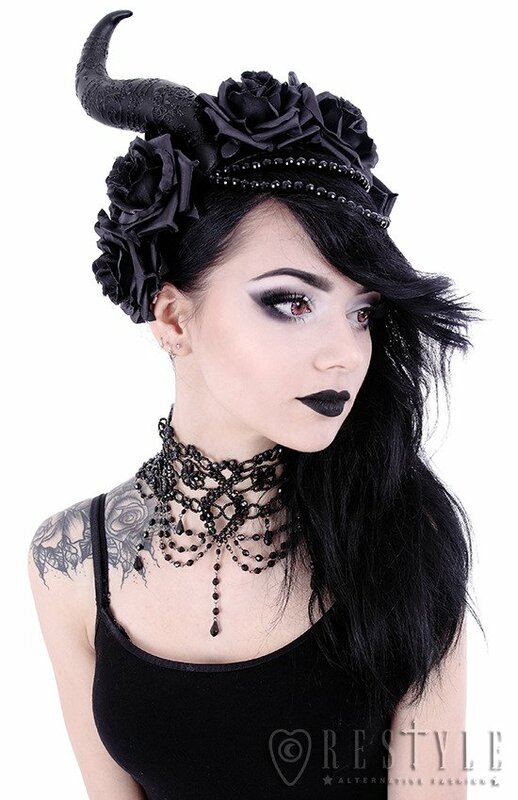 Headband additionally decorated with black roses and black, faceted beads. Really stunning and sturdy. 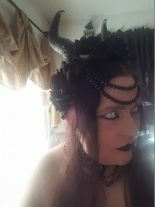 I spided it up by adding a black glitter skull in the center of the headpiece. 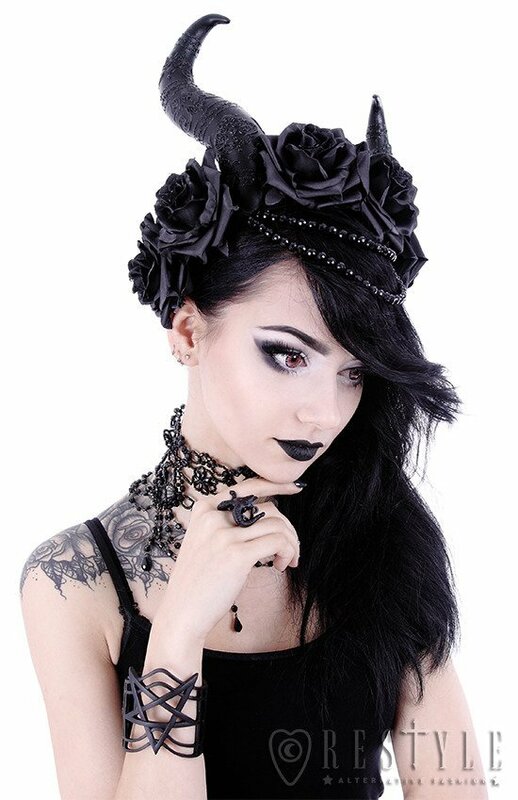 I absolutely adore this headdress. It is beyond amazing and everyone that sees it comments how stunning it is. When I was considering it, I felt I would probably have to glue some kind of combs in to keep it in place in my hair, and I wondered if it would give me headaches because I have a large head and cannot usually wear plastic headbands. Admittedly, it was so beautiful while I looked at it online, I felt I would happily suffer crippling migraines just to have a night out with it, so I purchased it. When it came I wore it immediately and was very impressed how light and well made it is, and how well it stays put on my head without needing any modification! The band is such that it is flexible without putting too much pressure. Perfection! It is often disappointing to shop online but every thing I have ever ordered from Restyle has been absolutely amazing and well made and exactly as shown. This was broken in the hairband section when I received it, but it didn't bother me. It is totally unnoticeable, doesn't affect to wearing it at all, so I wanted to keep the headpiece anyway. Very beautiful, I love it! These are BEAUTIFULLLL I love this headdress. I bought it to look like an evil fairy for a festival I was going to and now I find myself always trying to pair it with something in my wardrobe! Great headdress, sturdy yet lightweight. Bound to get compliments! This headdress is the best thing I have bought in a while! The only problem I had was that the beading was destroyed when I received it! It probably happened during the long shipping from Poland to Sweden, but for me, it doesn't matter (since I still can wear this headpiece and look damn good in it!) I still give it a 5/5, because I still look rad in it! This headdress is stunning, it is well made and pretty sturdy too. I wore it on New Years Eve and received so many compliments on it. It is light so it is comfortable to wear, and it stayed in place all night.